Every year, graduate students in history and public history showcase their work at the NC State Graduate Research Symposium. Read their stories. See their posters. Get inspired. Raleigh was a pioneer in developing an extended greenway system. 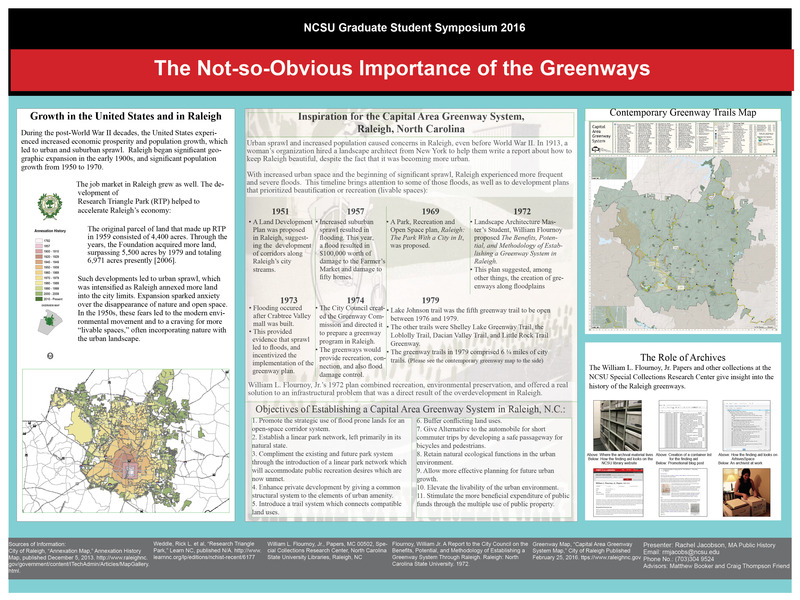 This poster examines key points in Raleigh’s history that led to the creation of the greenways, and explains why they succeeded at a particular moment in history. To tell this story I draw from important archival sources from the William L. Flournoy, Jr. Papers at NCSU Libraries Special Collections. During the decades following World War II, economic growth and booming population drove suburban development across the United States. Development led to sprawl in many areas, including Raleigh. Vast expansion around Raleigh dramatically increased impenetrable surface area, which caused frequent flooding. In the early 1970s, William L. Flournoy Jr. offered a green solution to this problem. Since floodplains are usually the last areas to get augmented, creating greenways along streams allows this land to remain penetrable, in a relatively natural state, and prevents buildings from getting built in fl ood zones. Flournoy’s Capital Area Greenway System was not the fi rst plan in Raleigh’s history that suggested a way to preserve the floodplains. In 1951 a plan was introduced calling for “public corridors” along the City’s streams. In 1969 a plan called “Raleigh: The Park with a City in it” proposed a similar idea. Why was Flournoy’s plan the one that got implemented? My research shows that this was partially due to timing. The 1970s were a time in which a plan, promising to make “natural areas” more accessible, would be especially popular because postwar expansion caused anxiety over the disappearance of nature. The Capital Area Greenway System offered an ecologically sound solution to an infrastructural problem while making Raleigh a more livable place. poster details: Is factionalism a factor in the persecution of religious minorities? The Effect of Factionalism on Jewish Persecution: How the Conflict between Bernard of Clairvaux’s Cistercian Order and Peter Abelard’s Scholasticism Reclassified Jews as Heretics. For the fi rst half of the Middle Ages, European society largely afforded Jewish populations a unique degree of acceptance, a privilege not shared with pagans, heretics, or other non-conformists. On the eve of the twelfth century, however, Jews became the victims of massacring crusaders and increasingly dehumanizing polemics, traditionally blamed on the Church’s irrational theology and Jews’ fi nancial role in society. Historians have since determined more valid reasons for the rise in anti-Jewish hostilities, such as the expansion of Gregorian Reform, the crusading ethos, the advent of Scholasticism, and a narrowly defi ned insistence on devout monasticism. The latest research from Berger (1972-2011), Abulafi a (1998), Cohen (1982-2004), Chazan (1997-2013), and Elukin (2007) permits an up-to-date analysis of the debate between the two strongest twelfth-century church movements as a strident factor in anti-Jewish persecution. These two popular movements of Cistercian apostolicism and Scholasticism’s primacy on rationalism stand as examples of factionalism. As both offered feuding epitomes of the ideal ecclesiastic model and permitted no allowance for differing views, the result was deleterious, especially for religious minorities. The build-up to the climactic meeting between the spokesmen of both movements (Bernard of Clairvaux and Peter Abelard) reinforced a growing hostility toward those who did not meet the ideal of either movement. The result was a narrowing window of what it meant to be Christian—a binary world shaped by demands of the strongest Church movements of the age. The direst consequences related to Jews, who did not meet the requirements of either faction: one’s intellect, salvation, even humanity were called into question, and left one subject to charges of heresy. The contribution of this study is to present the intellectual war within the twelfth-century Church and its damning effect on Jews, how this alienation of the rival philosophy reclassifi es the Jew as a heretic, and how endemic this confl ict between factions is in the history of Christendom. Second Place Prize in the Humanities Category! Acquired by the City of Raleigh Museum in 2012, the M.T. Pope House was built by Manassa T. Pope, an African American physician, veteran, politician, and father, in 1901. Pope passed in 1934; however, his daughters, Evelyn and Ruth lived and maintained the home until their deaths in 1995 and 2000. Currently, the City of Raleigh Museum administrators are considering ways to share the Pope family’s story with the community. Because of its inconvenient location, the Pope House Museum has struggled to attract visitors and compete with the many other historic sites in Raleigh. This summer, museum administrators and interns worked to bring the museum to visitors. Interns inventoried and catalogued Pope House Museum artifacts and developed a museum cart based on twentieth century medicine. The museum cart is designed to attract passersby in front of the City Raleigh Museum in the heart of downtown Raleigh. The cart relates to the City of Raleigh Museum’s work at the Pope House through discussions of twentieth century health and medicine. Through the cart, museum staff brings the Pope family’s story outside of their home and into the community. Recent scholarship encourages museum professionals to rethink interpretations at historic houses and their relationships with the public, but museum professionals must also consider how historic houses can transcend their physical space. Lesser-known museums, like the Pope House, instead of waiting for the public to visit, need to proactively take the museum to the community. By considering the Pope House Museum outside of its tangible significance, the City of Raleigh Museum is re-envisioning how they can attract visitors to the Pope House. Our hope is that the museum cart will provide one solution to historic house museums that struggle to attract audiences and encourage historic house museums to push their physical boundaries.